If you are looking for a summer holiday in a tranquil location with your family and friends then you need look no further than Champ Giraud. Set on an acre of land surrounded by fields of sunflower and maize, with woods and quiet lanes for a leisurely stroll, early morning jog or a stroll to the bakery then this is the place for you. There is a pool for a swim or relaxing by plus plenty of space for other activities such as table tennis or a game of boule maybe? 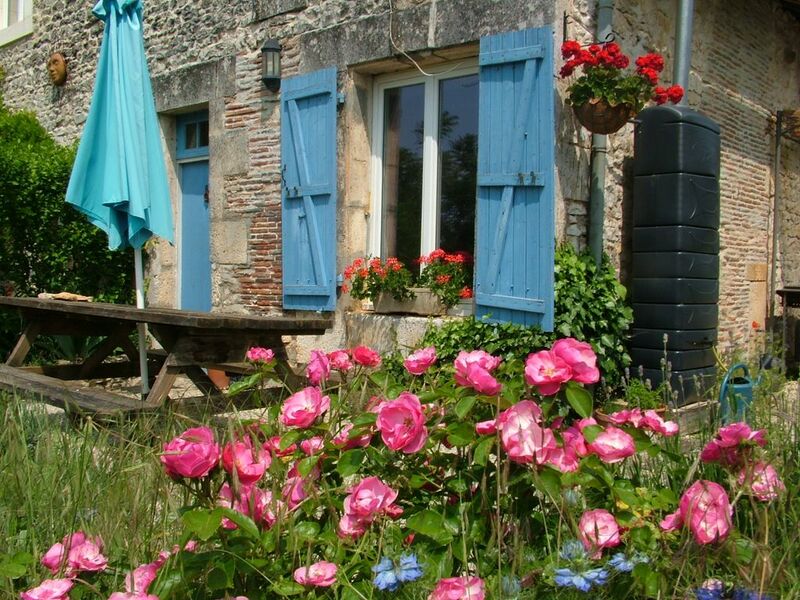 Sunrise cottage is the first of our 2 gites that you come to. Through the front door you step into the lounge, with dining area at the far end leading through into the kitchen and shower room. Upstairs is a double bedroom, a twin bedroom and a single bedroom. For entertainement there is a flat screen television, dvd player, cd player and a library of books, dvds and games. Champ Giraud is surrounded by fields of maize, sunflowers and woods with tracks and paths ideal for walking and cycling (we a few adult bikes to use at your own risk). There is plenty of wildlife to spot including, deer, foxes, hare and buzzards. The clear night skies are spectacular, because of no light pollution, ideal for star gazing. The nearby village of Vertetuil sur Charente is only a couple of km away with a good selection of shops, restaurants, tea rooms and bars; plus the possibility of a little tour around the chateau during the summer. The small town of Ruffec is 5km away,offering a bi-weekly market, a choice of supermarkets, butchers, bakers etc and a 2 screen cinema. Try canoeing on the Charente river or a day at Futuroscope. There are many interesting places to visit in all directions; take a tour of the Cognac houses; wander amongst the smallest monkeys in the world at Monkey Valley; stroll around Angouleme, home of the comic book and Ramparts Race; visit La Rochelle for a seafood platter. We can offer information on places to incorporate in to a full day out should you wish. We live on site and are always happy to help but also know how to be discrete, you are on holiday and may prefer your own company. We have a 17 year old Breton Spaniel and two cats who are guest friendly.